After a slow start, the Utah Jazz turned in on in second half en route to a 128-112 victory over the Atlanta Hawks Friday night in Salt Lake City. The Jazz (30-23) have won 12 of their last 15 games and currently sit in seventh place in the Western Conference standings. Seven Utah players scored at least 13 points, with Rudy Gobert (25 points, 13 rebounds) leading the way. Ricky Rubio finished with 22 points and 11 assists for his sixth double-double of the season, while Joe Ingles added 19 points on 7-for-12 shooting. 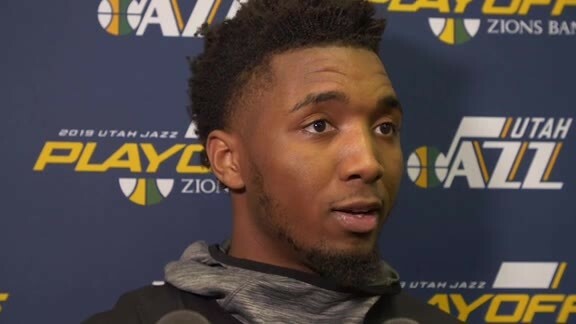 Donovan Mitchell (15 points, five assists), Derrick Favors (14 points, seven rebounds, four assists, two blocks), Kyle Korver (14 points) and Jae Crowder (13 points, eight rebounds) also scored in double figures for the Jazz. 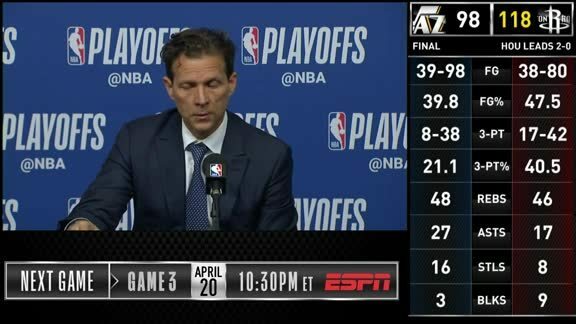 Utah trailed by double digits in the first half before outscoring Atlanta 70-52 in the final two quarters to secure the victory. "Our defense changed. 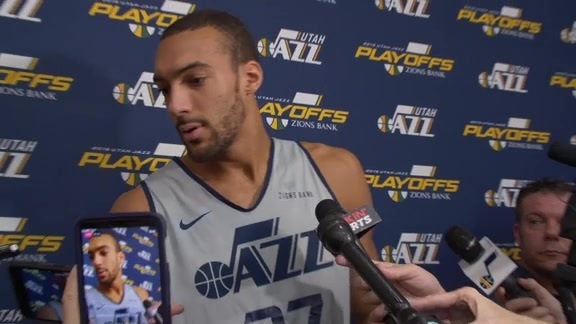 We didn't do a great job in the first half and we had to pick it up," Gobert said. "We came out ready in the second half." Rookie Trae Young, who was making his first appearance in Salt Lake City since he shot 3-for-12 at the Utah Jazz Summer League in July, led the Hawks (16-35) with 28 points on 9-for-20 shooting. He shot 5-for-10 from beyond the arc and added nine assists. Young is averaging 19.3 points and 7.3 assists in 15 games since the calendar flipped to 2019. Fellow rookie Kevin Huerter (the No. 19 overall pick) finished with 14 points and seven assists, while John Collins added 19 points in the loss. While the rest of the team was still getting warmed up, Ingles kept the Jazz in it early with 14 of his 19 points in the first half. He added seven rebounds, five assists and a block in 32 minutes. Ingles now has 35 games with at least five assists this season. Gobert picked up two fouls in the first four minutes and played only 12 minutes in the first half. After halftime, though, The Stifle Tower came alive, scoring 19 of his game-high 25 points in the final two quarters. Gobert added 13 rebounds, one assist and two blocks in 28 minutes, and he's now tied for the NBA lead (with Philadelphia's Joel Embiid) with 42 double-doubles. Utah fell behind early—thanks in large part to a 12-0 Atlanta run—before closing the first quarter on an 11-2 run. Mitchell and Favors got a bucket each before Crowder scored five straight points. Two free throws by Ingles gave the Jazz a two-point lead after 12 minutes. The Jazz trailed by as many as 11 points in the second quarter—thanks in large part to a 12-0 Atlanta run—but they closed the second quarter on a 16-7 run to pull back within two at halftime. Georges Niang made back-to-back corner threes, Favors put in two buckets, Rubio made a technical free throw, Mitchell scored in the lane, and Crowder hit a corner three. Utah kept that momentum rolling after the break, opening the third quarter on a 16-5 run. 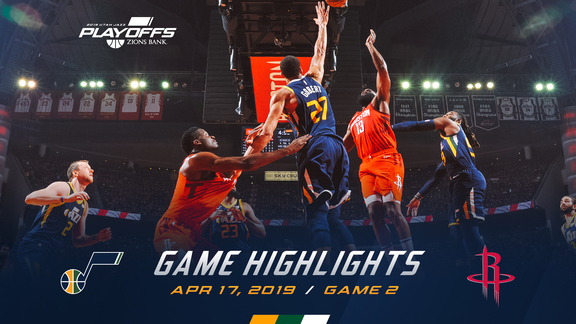 Mitchell banked it in from close range, Gobert made a layup while being fouled and then swatted away a layup attempt by Huerter, Rubio canned a corner three, and Gobert capped the run witt two straight two-handed dunks—both off passes from Rubio. The Hawks shot 2-for-17 to start the second half. A transition three by Korver two minutes later put the Jazz up by 12, and they cruised from there. Led by Gobert and Favors, the Jazz owned the restricted area. They outscored the Hawks 62-46 in the paint, and they also held a 51-40 advantage in rebounds. Utah scored 70 second-half points on a blistering 58.5 percent shooting, including 6-for-12 from 3-point range. Gobert (6-for-6, 19 points), Rubio (4-for-6, 17 points) and Korver (5-for-8, 12 points) caught fire over the final two quarters. "Atlanta's a good team. They're a unique team with the way they play, with Collins rolling and Trae Young's ability to make plays. I thought we did a good job adjusting. We got better defensively as the game went along, and the offense kind of took care of itself." Mitchell failed to score 22+ points for the first time since January 4 (14 games). 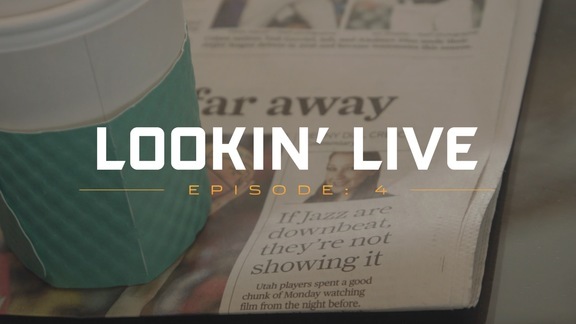 ... Danté Exum (ankle), Raul Neto (groin) and Thabo Sefolosha (hamstring) were once again out for the Jazz. ... Atlanta shot 39.8 percent from the field. ... Utah dished out 31 assists. ... The Jazz shot 24-for-30 (80.0 percent) from the free-throw line, while the Hawks shot 20-for-24 (83.3 percent). ... Utah is now 16-9 at home this season (after a 2-6 start). The Jazz will stay at home for the second half of their back-to-back set against the Houston Rockets on Saturday night. Tipoff is set for 7:00pm MT.